Background: Gastroesophageal reflux disease (GERD) is a common disorder that may result in esophageal cancer. Although proton pump inhibitors are the standard treatment for this illness, Brassica oleracea may provide new therapeutic possibilities. Objectives: We aimed to evaluate and compare the effects of the B. oleracea extract and the proton pump inhibitor omeprazole on esophageal complications arising from a surgically-induced GERD model in rats. In addition, we investigated possible associations between the frequency of DNA damage and esophageal histological alterations, as well as the genotoxic/anti-genotoxic and cytotoxic/anti-cytotoxic effects of B. oleracea and omeprazole. Methods: Rats with and without GERD were equally divided into groups to receive one of two the treatments, B. oleracea extract (500 mg/kg bw) or omeprazole (30 mg/kg bw), daily over the course of four weeks. A group of non-treated rats received water in the same circumstances. Micronucleus assay was used to assess DNA damage in blood and bone marrow cells. Results: Rats with GERD developed esophagitis and esophageal squamous cell carcinoma. B. oleracea and omeprazole-treated GERD rats presented significantly decreased inflammation in relation to non-treated GERD rats (P < 0.05). However, in rats without GERD, omeprazole significantly increased the frequencies of micronuclei and micronucleated cells as compared to the corresponding cell counts in non-treated rats (P = 0.04). Conclusions: B. oleracea demonstrated similar anti-inflammatory properties to omeprazole in rats with GERD. However, omeprazole also demonstrated genotoxic and cytotoxic effects in rats without GERD. Gastroesophageal reflux disease (GERD) is a major digestive disorder in western countries (1, 2). Untreated or improperly treated GERD can, in cases of chronic disease, lead to serious complications, including Barrett’s esophagus and esophageal adenocarcinoma (3). Studies of esophagitis focusing on inflammation have increasingly drawn attention to the fact that GERD should be considered an inflammatory disease (4). During inflammation, the release of reactive oxygen and nitrogen species can result in DNA damage, such as strand breakage, alterations in guanine and thymine bases, and DNA cross-linkage (5). The induction and accumulation of DNA damage may lead to genomic instability, which is a crucial step in the development of cancer (6). Proton pump inhibitors are the standard therapy for GERD. However, despite the efficacy of these drugs, 80% of patients have a recurrence of symptoms in the first six months after interrupting treatment (7). Moreover, patients with prolonged use of proton pump inhibitors have an increased risk of fractures associated with osteoporosis (8), and a greater prevalence of pneumonia (9). Fruits and vegetables have been increasingly investigated for their abilities to prevent diseases. The Brassicaceae family, which includes cruciferous vegetables, has been extensively investigated in studies on chemoprevention (10). One group of chemoprotective substances present in cruciferous vegetables is isothiocyanates (ITC), which are formed by the myrosinase hydrolysis of glucosinolates (11). One of the most studied ITCs is sulforaphane (SF) because of its ability to inhibit phase one enzymes (those involved in the activation of carcinogens), cell proliferation, angiogenesis, and the progression of tumors and metastasis; it is also capable of inducing phase two enzymes (those involved in the detoxification of carcinogens) and apoptosis. SF can therefore prevent, delay, or reverse preneoplastic lesions, acting as a therapeutic anti-cancer agent (12). These activities have been identified in studies with mixtures of ITCs or isolated components. However, little is known about the efficacy of these compounds in modifying the progress of diseases following the consumption of cruciferous vegetables. Brassica oleracea (L. var. acephala), popularly known as kale, belongs to the family Brassicaceae and is widely cultivated and consumed in Brazil. A previous study has indicated that the ingested juice prepared from the leaves of this cruciferous vegetable results in relief of gastroesophageal discomforts. Moreover, B. oleracea is the most commonly used plant by the Brazilian population to relieve gastritis and gastric ulcers (13). This study aimed to evaluate and compare the protective effects of B. oleracea extract and the proton pump inhibitor omeprazole on esophageal complications arising from a surgically-induced GERD model in rats. In addition, we investigated the possible associations between micronucleus and/or micronucleated erythrocyte frequencies and the histological alterations in esophageal mucosa, as well as the genotoxic/anti-genotoxic and cytotoxic/anti-cytotoxic effects of B. oleracea and omeprazole. Fresh B. oleracea leaves were obtained from an organic grower in Salesópolis, São Paulo, Brazil. Extracts were prepared as previously described (14), with some modifications. First, the collected leaves were washed and stored in portions at -80°C. When required, each portion was thawed and ground in a home mixer with distilled water. The resulting juice and residue were cooked together in a microwave oven for three minutes and squeezed through gauze. Distilled water was used to wash the residue from each portion. The solution containing cooked juice and residual water extract was lyophilized and subsequently stored in the dark. The extract yield was 46 g of powder/kg of fresh B. oleracea leaves. The lyophilized extract (100 mg) was diluted in 1 mL of methanol and centrifuged at 200 g for 5 minutes at room temperature. The supernatant was filtered through a 0.22 µm nylon filter (Millipore, Temecula, CA, USA). SF was quantified by high performance liquid chromatography (HPLC) with a UV-VIS detector at 254 nm. A volume of 5 µL of extract was injected and resolved on a Zorbax-SB C18 reverse-phase ODS column (250 × 4.60 mm, 5 µm, Agilent Technologies, Waldbronn, Germany). A mobile phase consisting of 0.5% (v/v) trifluoroacetic acid (solvent A) and acetonitrile (solvent B) was applied for linear gradient elution (10 min 15% B, 15 minutes 50% B, 2 minutes 100% B, maintained for 2 minutes, 3 minutes 15% B, maintained for 2 minutes) at a flow rate of 1 mL/min. A standard SF (LKT Laboratories, Saint Paul, MN, USA) was used both to determine the elution time and to construct a standard curve for the quantification of SF. The maximum non-toxic concentration was determined as previously reported (15). MDBK cells (ATCC CCL-22) were seeded at a density of 3 × 104 cells/well in 96-well microtiter plates containing EMEM (GIBCO, Grand Island, NY, USA) supplemented with 10% fetal calf serum (GIBCO). After incubation for 24 h at 37°C in a humidified 5% CO2 atmosphere, the supernatant was discarded. Extract was diluted to a concentration of 4000 µg/mL in EMEM, and serial dilutions (1: 2) down to a concentration of 1.9 µg/mL were added to duplicate wells for 96 hours at 37°C. Cytotoxicity was scored based on the occurrence of any observable alterations in cell morphology. Extract concentrations ≤ 500 µg/mL produced no macroscopic morphological alterations in the cells, and this upper limit was considered the maximum non-toxic concentration. Therefore, this dose was selected for the animals’ treatment. Twenty-four seven-week-old male Wistar rats (200 - 210 g) were housed under standard laboratory conditions (22 ± 2°C, relative humidity 55 ± 5%, and a 12 h light-dark cycle) with water and chow given ad libitum. The rats were acclimatized for one week and then randomly divided into two groups: (1) rats with GERD (n = 12), in which the animals underwent a specific surgical procedure to induce GERD; and (2) rats without GERD (n = 12), in which the animals were not submitted to any surgical procedure. This study was approved by the research ethics committee of the Universidade Federal de São Paulo (UNIFESP) and followed the standards published in the NIH Guide for the Care and Use of Laboratory Animals (16). To induce GERD, the rats were deprived of food for 5 h but had free access to water. General anesthesia was induced via an intraperitoneal injection of a mixture of ketamine (163 mg/kg) and xylazine hydrochloride (8 mg/kg). After trichotomy and asepsis of the operating field, the abdominal wall was infiltrated with a solution of 5% lidocaine hydrochloride and a midline upper abdominal incision was performed. The esophageal-gastric transition was identified and sectioned, after which the duodenal arch was displaced and the esophageal stump then anastomosed end-to-side to the jejunum 3 cm from the pylorus. The anastomosis was sutured with polypropylene surgical thread 6.0, and 1 mL of saline containing 1.2% dipyrone was instilled into the abdominal cavity. Polyglycolic acid surgical thread was used to close the abdominal wall, followed by swabbing with hydrogen peroxide for overall sterilization. Postoperatively, the rats received 5% serum glucose when they awoke, followed by chow 48 h later. The rats were monitored daily and weighed once a week until the 8th week. Rats with and without GERD were divided equally into groups to receive B. oleracea extract (500 mg/kg bw) or omeprazole (30 mg/kg bw; EMS Laboratories, Hortolândia, SP, Brazil), or water (6 mL/kg bw). From the 8th week onwards, rats were fasted for 30 minutes and then received one of the treatments or water by gavage every morning, and were weighed once a week until the 12th week. After this period, rats were euthanized by CO2 inhalation. The entire esophagus was subsequently removed, opened longitudinally, and examined for gross and histological abnormalities. Samples of heart blood were obtained, and the femur was removed from each animal. Femur epiphyses were removed, and the bone marrow was then flushed into centrifuge tubes with 2 mL of fetal calf serum (GIBCO). The suspension was centrifuged at 200 g for 5 minutes, and the pellet then re-suspended in 0.5 mL of fetal calf serum. Each esophagus was washed in physiological solution, fixed in buffered 10% formalin for 24 hours, and transferred to 70% ethanol. The formalin-fixed esophagi were embedded in paraffin. Serial sections 5 µm thick were mounted on glass slides and stained with hematoxylin and eosin (HE). 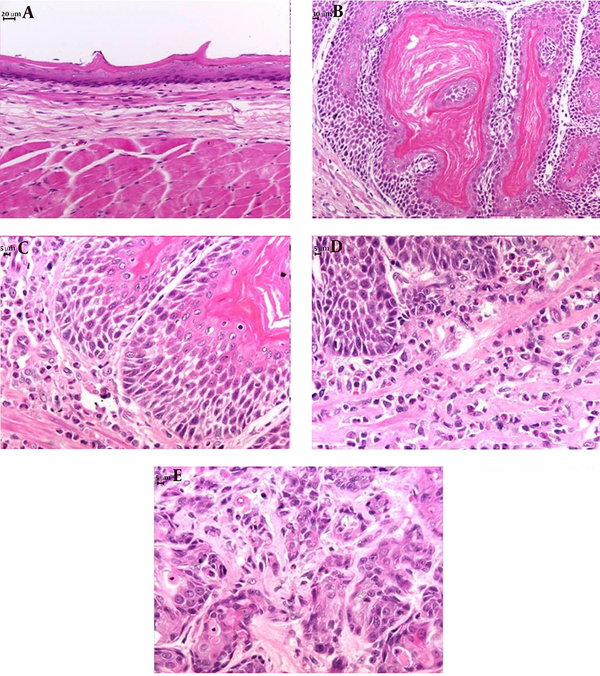 A blinded histological analysis of the sections was performed to identify the presence of inflammatory precursors, esophagitis, Barrett’s esophagus, and carcinoma. Esophagitis was classified as: (1) mild when epithelial papillae projected to one-third of the epithelial thickness and/or there was an inflammatory infiltrate in the lower third of the epithelium; (2) moderate when epithelial papillae projected to two-thirds of the epithelial thickness; and (3) severe when epithelial papillae projected to more than two-thirds of the epithelial thickness (17). The assay was performed as previously described (18). Heart blood and bone marrow smears from each rat were prepared on pre-cleaned, dry microscopic slides. The smears were fixed in methanol for 15 minutes and stained with Leishman’s solution for 4 min. For each rat, 2,000 polychromatic erythrocytes were scored to determine the number of micronucleated polychromatic erythrocytes and micronucleus frequencies, as well as the micronucleus distribution. The polychromatic and normochromatic erythrocyte ratios (PCE/NCE ratio), which provide an index of cytotoxicity, were determined by analyzing 200 bone marrow erythrocytes per rat. As a positive control group, four animals received a single intraperitoneal injection (1 mL) of the reference mutagen cyclophosphamide (50 mg/kg bw) 24 hours before being euthanized by CO2 inhalation. Data were checked for normality by using the Shapiro-Wilk test. One-way analysis of variance (ANOVA), the Mann-Whitney tests, and chi-squared tests were used for statistical analysis of the results. A value of P ≤ 0.05 and/or an effect size ≥ 0.75 by Pearson correlation (r) indicated statistical significance. The standard SF was eluted at 20.8 minutes, and addition of this standard to the B. oleracea extract allowed for the identification of SF eluting at 20.8 minutes (Figure 1). A, Standard sulforaphane; B, B. oleracea extract; C, B. oleracea extract and standard sulforaphane. The arrows indicate the positions of sulforaphane peaks. Because of the difference in body weights, rats with GERD ingested significantly less of the extract (t = 7.47, df = 14, P < 0.01, r = 0.89; Table 1), and consequently, less SF (t = 7.28, df = 14, P < 0.01, r = 0.89; Table 1) than rats without GERD during the four weeks of treatment. aSignificantly different (P ≤ 0.05) from total group of rats without GERD. bfrom rats without GERD treated with B. oleracea. There were no significant differences in the initial body weights of the different groups of rats studied (Table 1). However, rats with GERD weighed significantly less than rats without GERD after eight weeks (t = 10.99, df = 22, P < 0.01, r = 0.92; Table 1) and 12 weeks (t = 10.42, df = 22, P < 0.01, r = 0.91; Table 1). All rats with GERD showed macroscopic erosion throughout the esophagus and dilatation of the esophageal cavity, independently of the type of treatment they received. Microscopically, hyperkeratosis, acanthosis, erosion, ulceration, spongiosis, esophagitis and squamous cell carcinomas were observed (Table 2, Figure 2). Rats with GERD treated with B. oleracea showed decreased severity of inflammation compared to the rats with GERD receiving only water (χ2 = 2.67, df = 1, P = 0.06, r = 0.94; Table 2). In addition, rats with GERD treated with omeprazole showed less spongiosis (χ2 = 2.67, df = 1, p = 0.06, r = 0.94; Table 2) and decreased severity of inflammation compared to the rats with GERD receiving only water (χ2 = 8.00, df = 2, P < 0.01, r = 0.83; Table 2). In rats without GERD, there were no macroscopic and microscopic alterations in the esophageal tissue of the animals regardless of the treatment they received (Table 2). aSignificantly different (P ≤ 0.05) from rats without GERD receiving water. bSignificantly different (P≤ 0.05) rats without GERD treated with B. oleracea. cSignificantly different (P ≤ 0.05) rats without GERD treated with omeprazole. dSignificantly different (P ≤ 0.05) rats with GERD receiving water. eSignificantly different (P ≤ 0.05) rats with GERD treated with B. oleracea. fSignificantly different (P ≤ 0.05) rats with GERD treated with omeprazole. A, Normal esophageal tissue; B, Hyperplasic epithelium with hyperkeratosis; C, Spongiosis; D, esophagitis; E, Squamous cell carcinoma. Magnification × 400. There were no differences in the micronucleus and micronucleated erythrocyte frequencies among the treatments in rats with GERD (Table 2) and among the grades of esophagitis (data not shown). In contrast, rats without GERD treated with omeprazole showed increased frequencies of micronuclei and micronucleated cells when compared to the rats without GERD receiving water (U = 1.0, P = 0.04, r = 0.75; Table 2). In addition, the rats without GERD receiving cyclophosphamide showed a significant increase in these frequencies when these rates were compared to the corresponding rates among the rats without GERD receiving water (U = 0.5, P = 0.03, r = 0.77; Table 2). Treatment with cyclophosphamide also decreased the proliferation index when compared with the other groups and treatments evaluated (U = 0.1, P = 0.021, r = 0.82 for each comparison; Table 2). The experimental esophagojejunostomy model used in our study resulted in inflammatory precursors, esophagitis, and squamous cell carcinoma in the esophageal mucosa of rats 12 weeks post-operatively, with no evidence of Barrett’s esophagus or esophageal adenocarcinoma. The presence of squamous cell carcinoma in one of our rats can be explained by the absence of Barrett’s esophagus. Adenocarcinoma and squamous cell carcinoma are subtypes of esophageal cancer and are observed in animal models of GERD, with adenocarcinoma being commonly associated with Barrett’s esophagus, whereas squamous cell carcinoma is associated with mucosal inflammation (19). Despite the importance of a mixture of gastric and duodenal components in GERD, a study has suggested that carcinogenesis is mediated mainly by oxidative stress as a result of chronic inflammation (20). Consequently, the use of nutritional compounds capable of inhibiting the inflammatory process may be an important approach in preventing the progression of GERD (21). As shown here, treatment with B. oleracea extract decreased the severity of esophagitis without genotoxic and cytotoxic effects. The principal compound present in B. oleracea capable of attenuating inflammation is SF, as demonstrated in gastritis and skin inflammation studies (22-25). These studies have shown that SF suppresses pro-inflammatory cytokines, such as tumor necrosis factor-α, interleukin-1β and interleukin-6 via nuclear factor-erythroid-2-related factor and/or inhibition of the activator protein-1. To our knowledge, the present study is the first to describe the anti-inflammatory effect of a B. oleracea extract in esophageal tissue. Of particular interest was the finding that the anti-inflammatory effect was observed at a much lower oral dose of SF/day compared to the doses used in a variety of other rodent experiments (22, 23, 26-28). As expected, omeprazole prevented the development of spongiosis and decreased the severity of inflammation. Since gastric reflux from the pylorus can be completely neutralized by duodenal contents in the esophagojejunostomy model, it is probable that the anti-inflammatory action of omeprazole did not result from the inhibition of gastric secretion (20). Studies have shown that proton pump inhibitors can exert anti-inflammatory and anti-oxidative effects unrelated to the inhibition of gastric acid production (29). Inactive forms of omeprazole in circulation can suppress important aspects of chronic inflammation, such as the adhesion of neutrophils to endothelium and the extravascular migration of neutrophils, leading to a reduction in the infiltration of inflammatory cells (30). In addition, studies in vitro and in clinical reports have shown that proton pump inhibitors prevent free radical production by neutrophils and block neutrophil degranulation (31). The finding that omeprazole was genotoxic in control rats is in agreement with the data from studies involving healthy volunteers (32). Together, these findings indicate that an intact digestive system is essential for the normal metabolism of omeprazole and the release of the sulfonamide derivative into circulation. Sulfonamides are highly reactive species capable of binding to DNA in vivo (33). In contrast, as demonstrated in our study, omeprazole was not genotoxic in rats with GERD, probably because of insufficient acidity to convert omeprazole into its sulfonamide derivative (34). Our initial hypothesis that chromosomal damage detected in blood could represent a biomarker for esophageal damage arising from GERD proved to be unfounded. The inflammatory events that contributed to esophageal damage were probably insufficient to affect blood cells and cause chromosomal damage. In addition, it is possible that other alterations associated with inflammation may only be detected by methods different from those used here. Together, our findings highlight the need of care when using omeprazole continuously, and suggest that the consumption of B. oleracea may provide therapeutic effects against GERD-induced esophageal inflammation, contributing to the prevention of esophageal cancer. The authors thank Rafael de Faria for kindly providing the B. oleracea leaves, and Juscelino M. Nagai for statistical help. This work was supported by the Fundação de Amparo à Pesquisa do Estado de São Paulo (FAPESP) and Coordenação de Aperfeiçoamento de Pessoal de Nível Superior (CAPES). Authors’ Contribution: Study concept and design: Fernanda Wisnieski, Dertia Villalba Freire-Maia, and Sandra Aparecida Takahashi-Hyodo; extract preparation and dose determination: Fernanda Wisnieski, Isabela Cristina Simoni, and Maria Judite Bittencourt Fernandes; sulforaphane analysis: Maxuel Andrade and Deborah Yara Alves Cursino Santos; surgical experiments: Pedro Luiz Brito, Fernanda Wisnieski, and Sérgio Tomaz Schettini; treatment and sampling: Fernanda Wisnieski and Perseu Artemus Pinto; histological analysis: Luís Fernando Barbisan; micronucleus assay: Fernanda Wisnieski and Stella Regina Villarinho Naddeo Cosenza; statistical analysis and manuscript drafting: Fernanda Wisnieski; critical revision of the manuscript: Dertia Villalba Freire-Maia and Sandra Aparecida Takahashi-Hyodo; administrative, technical, and material support: Dertia Villalba Freire-Maia.